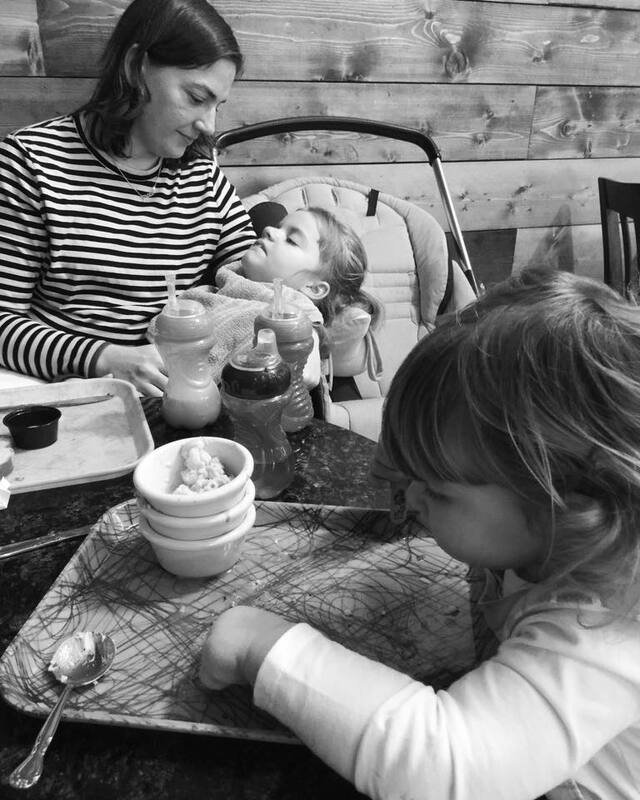 When Grace was diagnosed with INAD in November 2014, we were devastated to know there was no cure for her condition, even worse there were no treatment options. We were told to continue with therapy and just give Grace the best life that we could. So, we took that to heart and began the long road down A Grace-Filled Journey. Last year, we learned that a new potential treatment had been discovered in the drug, RT0001, by a company in California called Retrotope, who was hoping to start a clinical trial in the next year. It’s been a waiting game as sites worked hard to get set up in New Jersey and in California. 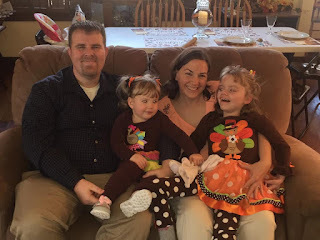 And although we submitted Grace’s name to the study, ultimately, it was up to the site doctors to select the patients best suited for the study. 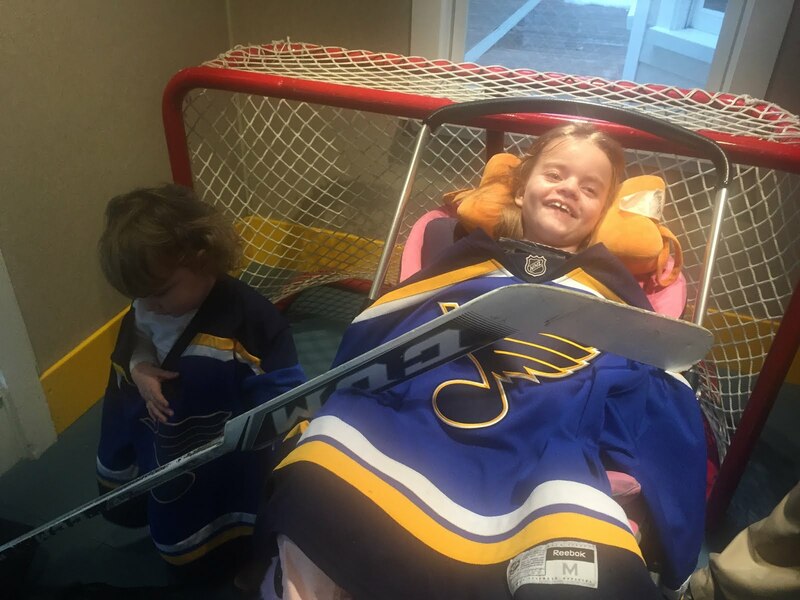 Earlier this month, we got a phone call from a hospital in New Jersey that Grace was eligible to participate in the first-ever clinical trial for INAD patients. It was officially started in November, and several families had already been enrolled. 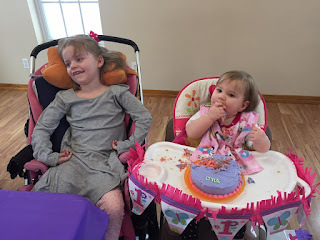 Kyle and I have been talking about the pros and cons of the trial for the past year, and whether or not we would go if Grace had the chance. First off, this drug is not a cure for INAD, not by any means. It’s a drug that could help slow the regression of the disease and possibly help patients gain back some skills lost. Other families who have tried the drug already haven’t noticed life-altering changes, but they have noted more alertness and smiles, among other small changes. Ultimately, Kyle and I decided that we wanted Grace to participate. 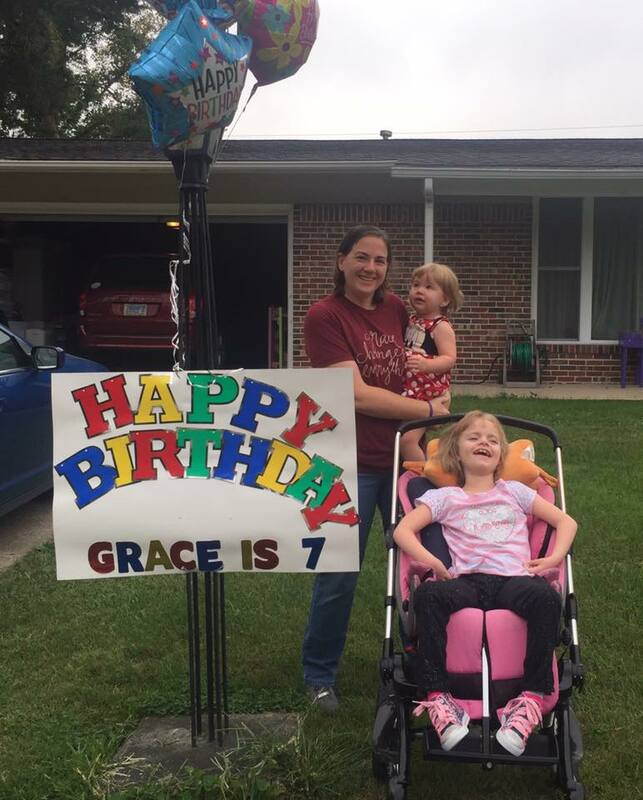 There might only be a small chance that it helps her, but we want Grace to have every chance life has to offer. The study could also be impactful for INAD research down the line, and we want to be a part of that too. And since the drug is a fat, it’s unlikely to have unpleasant side effects for Grace as well. 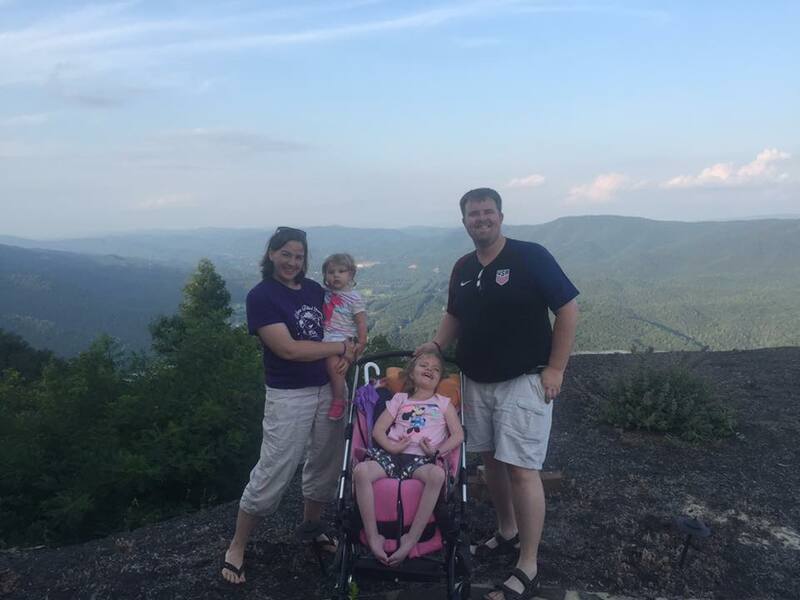 This weekend, Kyle, Grace and I will be driving to New Jersey, where Grace will have three days of baseline testing. We return in mid-February, where she will have a chance to start taking the drug. 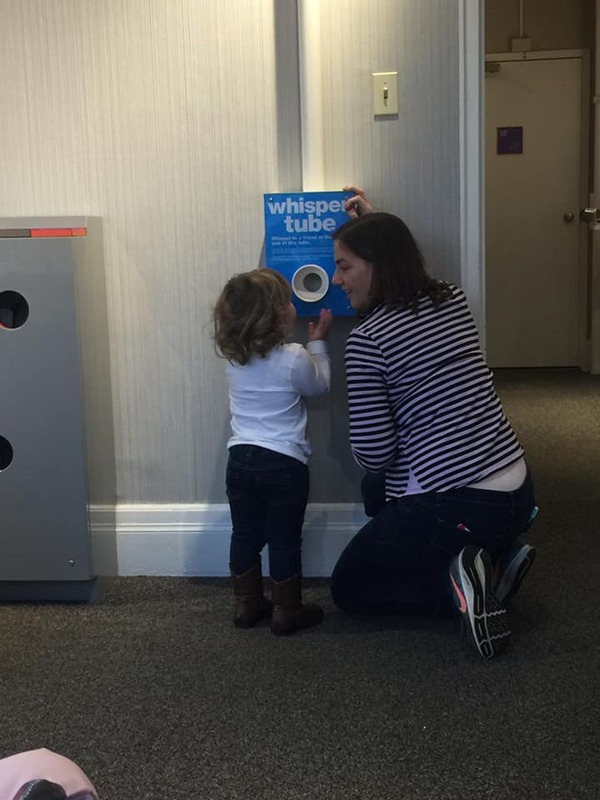 The study ultimately requires two more check-up visits at six months and one year. We ask that you keep us in your thoughts and prayers in the coming week for safe travel, as well as wisdom in making the best decisions we can for Grace. 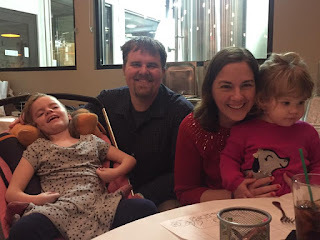 We're not sure what adventures await us on our journey, but we feel very blessed to have this chance for Grace, and we're so grateful to everyone who shares in our Grace-Filled Journey. They’re baaaack! 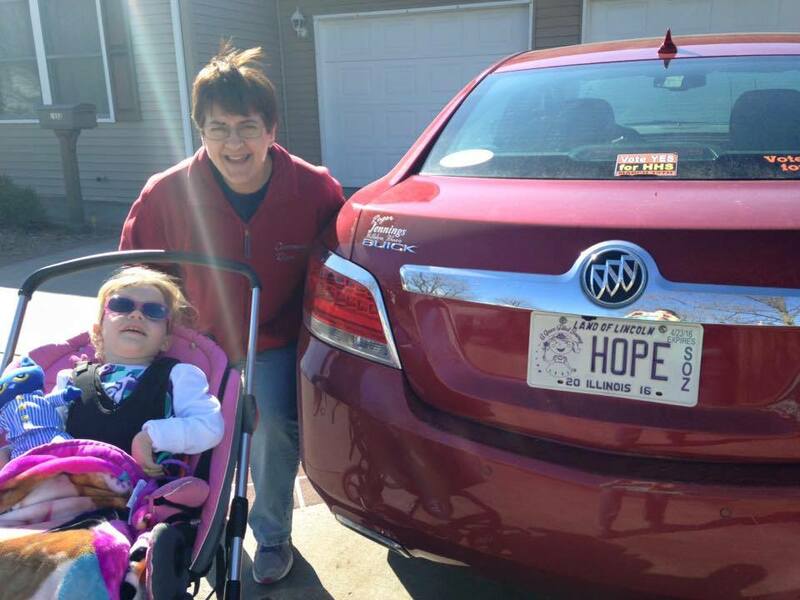 It’s time again for one of our very favorite INAD fundraisers - temporary Grace license plates! And while Kyle and I still haven’t decided what to get on our vehicles just yet, we can’t wait to see all the fun things people choose. This will be the fourth year the temporary licenses plates for Grace have been available. It was started by Jo Brummet and the Litchfield High School Student Council, leading up each year to the county-wide baseball tournament. In the past, the license plates have been both white and silver with our favorite princess logo on the left hand side. The first year, Kyle and I chose BEAT for the car and INAD for the van, which looked pretty cool when we parked on Main Street side-by-side. The second year, everyone got a variety of numbers. And last year, we picked TEAM GRCE. We ended up giving one of the TEAM plates to Lincolnwood Athletic Director Josh Stone, who helps to coordinate the TEAM golf outing every year, and we gave one of the GRCE ones to our favorite St. Louis eatery, Grace Meat+Three, where it is hanging on the wall next to a tray signed by Andrew Zimmer. Yup, pretty cool. Grandpa John and Grandma Susie got HOPE on one of their vehicles. The fundraiser is pretty simple. Forms are available at both Hillsboro High School and Litchfield High School and The Journal-News office in Hillsboro. Forms are also downloadable, and you can find them on our Facebook page at A Grace-Filled Journey. You fill out the form, and pick out what four letters or numbers you would like on your license plate. The first digit has to be a letter, but the other three can be a combination of letters and numbers. Last year, we got TEAM GRCE. Once you’ve picked out what you want, you make a copy of your driver’s license and registration, and turn it in with the $30 fee. This year, registration forms are due to Jo Brummet at Litchfield High School by Feb. 20. They can also be returned to the office at Hillsboro High School. 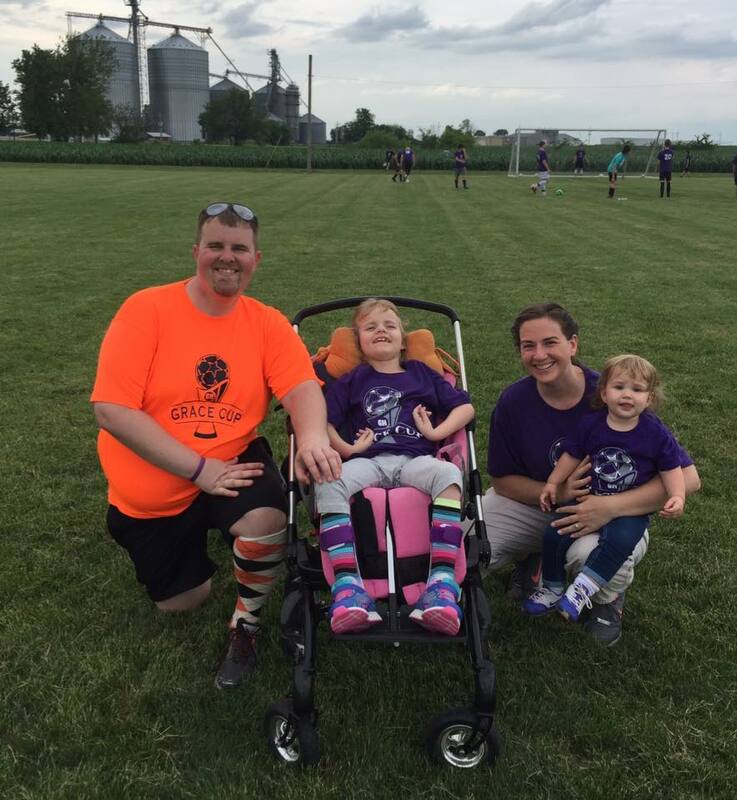 The temporary license plates are good on Illinois vehicles from April 3 through June 1, with a culmination celebration this year at the Grace Cup senior soccer game on Saturday, June 8, in Raymond. Grace shows off one of the sample plates for publicity. 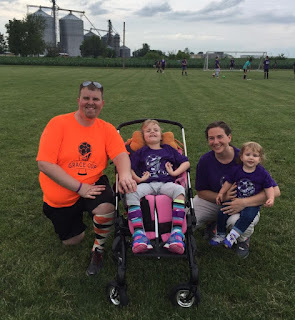 Right now, we have specialty license plates on our van in honor of our buddy, Camden Burke, who was diagnosed with Cri du Chat, and it’s been fun to see all the orange plates around town in his honor and know there are so many out there supporting him and his family. That’s the coolest part to us. 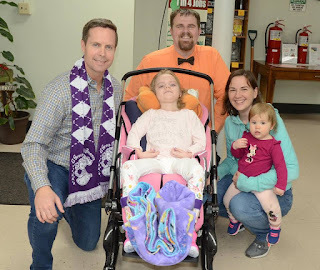 During the Grace plate fundraiser, everywhere we go, every single event that we cover, we see the Grace plates, and it’s just an amazing feeling knowing there are so many people out there who love and support us. It’s fun to try and figure out what each one means or whose vehicle it is. But mostly, it’s just an overwhelming feeling of gratitude for all those who love our Grace. So, you still have plenty of time to get signed up, and if you have any questions, you can contact Jo Brummet at Litchfield High School at jbrummet@litchfieldpanthers.org. All proceeds benefit Grace and INAD research. Thanks for all your support and your help to #BeatINAD. 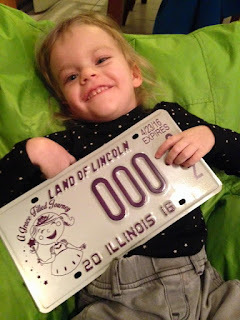 Oh, and when your license plates come in, don’t forget to post photos on Facebook so we can see them! We've had the pleasure of meeting some really awesome people on our Grace-Filled Journey, and tonight, we got to celebrate the 60th birthday of one of them. I can't say that we met Dave Kane because of Grace's illness. We knew him before we even had Grace, but he has and continues to be one of her biggest supporters. Flat Gracie came along for the birthday celebration. Dave is a sports writer for the Springfield State Journal-Register, and routinely covers sports teams in Montgomery County. So, Kyle and I have known Dave for a long time. And Kyle would tell you that Dave is one of the biggest influences on his sports writing career. Well, that and the fact that he married the boss's daughter. In a lot of ways, Dave and Kyle are two peas in a pod when it comes to covering high school sports. They care about the kids and their teams, and both do such a great job of writing for their newspapers. So, it's only natural that our paths would cross. It was a fun night out with our family. When Dave found out about Grace's diagnosis, he was one of the first ones to ask us for a purple gracelet to wear. In fact, I think Dave is on about his second or third gracelet, and he's always helping us to raise awareness for INAD. 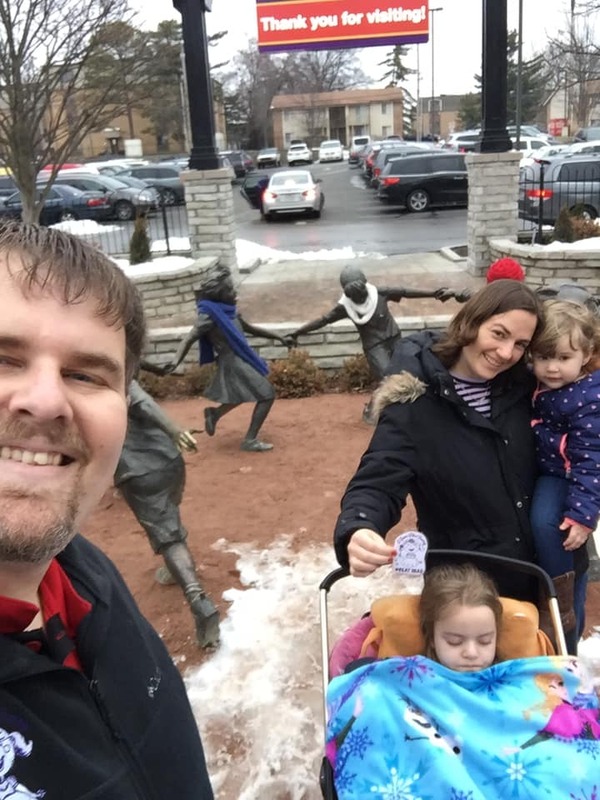 When we were working on publicity for our second Grace Race, we reached out to Dave, and he got us set up with a reporter from Springfield to do a story on Grace and the 5K. 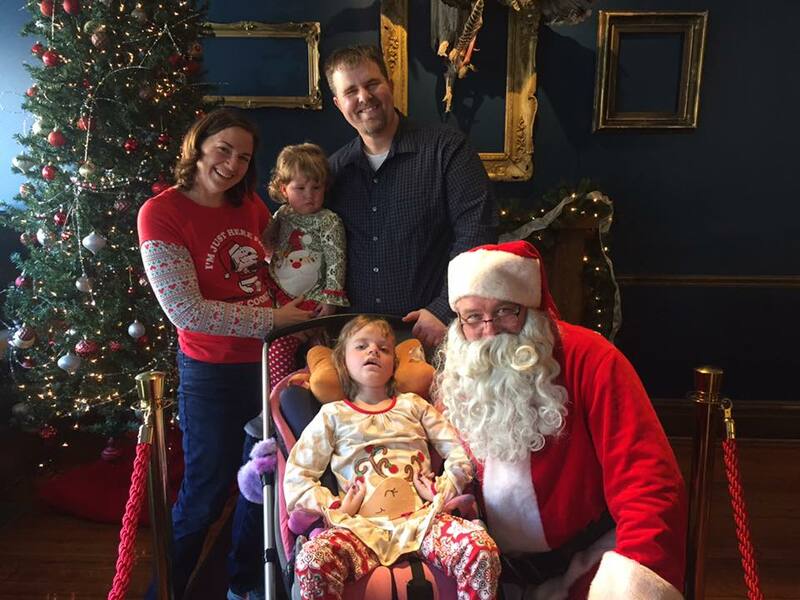 That story even inspired a virtual 5K in Springfield, organized by some friends of ours. One of the most special moments with Dave was a chance to meet his wife, Abbe, before she passed away. Grace was at her usual physical therapy appointment in Springfield, and Dave and Abbe just happened to be there. They made sure to stop by our room, and we loved meeting her and visiting with her. I'm sure she and I could have shared a lot of stories about being married to sports writers. I even told her about Kyle's favorite road trip game, "Guess the Mascot." She laughed a lot and said Dave never made her play that one. 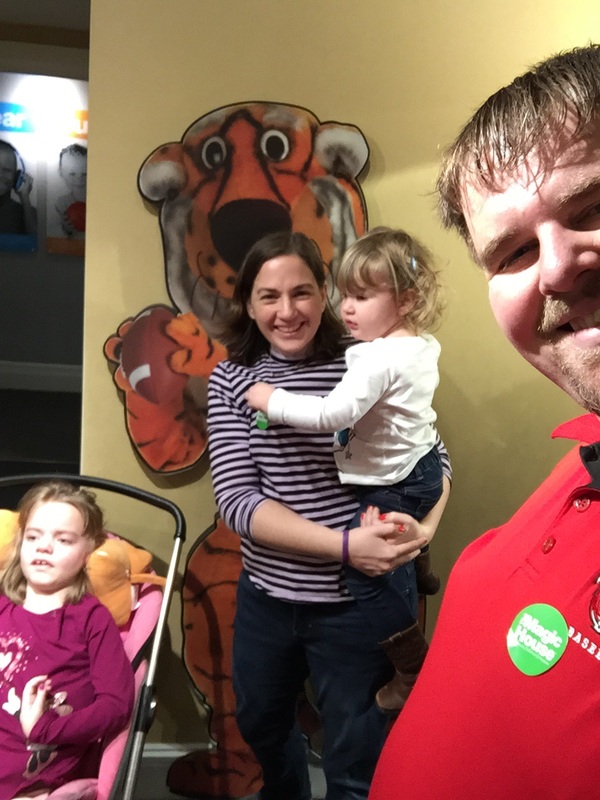 Needless to say, we were delighted to receive a card from Dave's children a few weeks ago in the mail inviting us to a surprise birthday party in his honor. Originally, we didn't think we would be able to attend as our newspaper's Christmas party was scheduled for tonight. However, our party got cancelled because of the threat of inclement weather, and when we didn't get much accumulation, we were able to go to Dave's birthday party tonight. Although we are almost never on time, we managed to make it to the restaurant before the surprise. 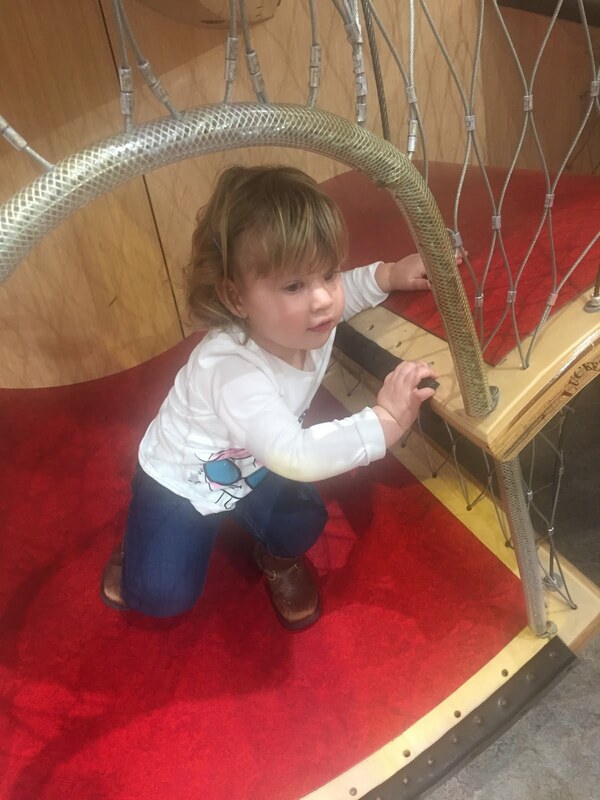 We enjoyed meeting Dave's children, and Charlotte was especially delighted to play with his grandson, Liam. The two were practically inseparable all night, and it was so much fun to watch. I think the best part of the night was seeing the look of surprise on Dave's face when he arrived at the party, and we were just so honored to be there to help him celebrate. We loved visiting and catching up. He and Kyle talked basketball tournaments, and we enjoyed visiting with some other area newspeople too. This Grace-Filled Journey definitely has its share of ups and downs, but the people we have met along the way, and who continue to share in our journey, definitely make the ride worthwhile. Happy 60th birthday, Dave, and many happy returns! 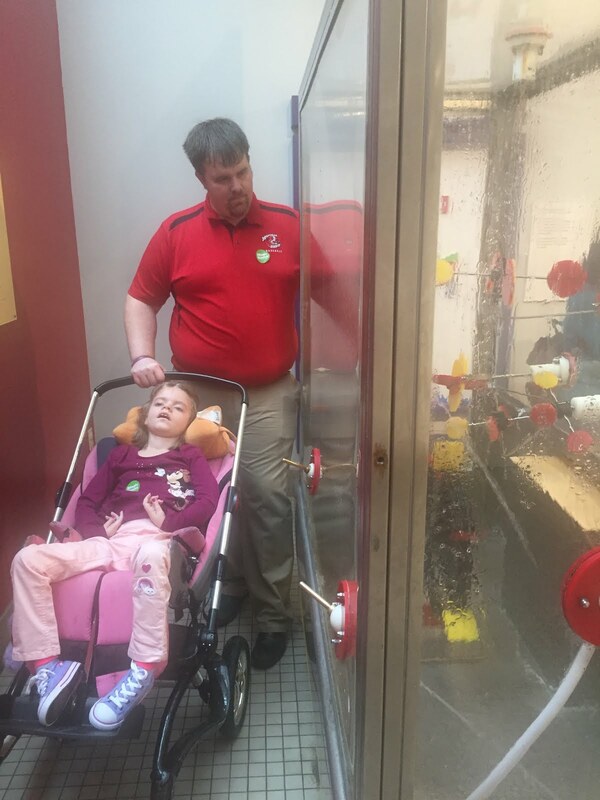 For the past five years, Fridays typically mean physical therapy in Springfield for Grace. 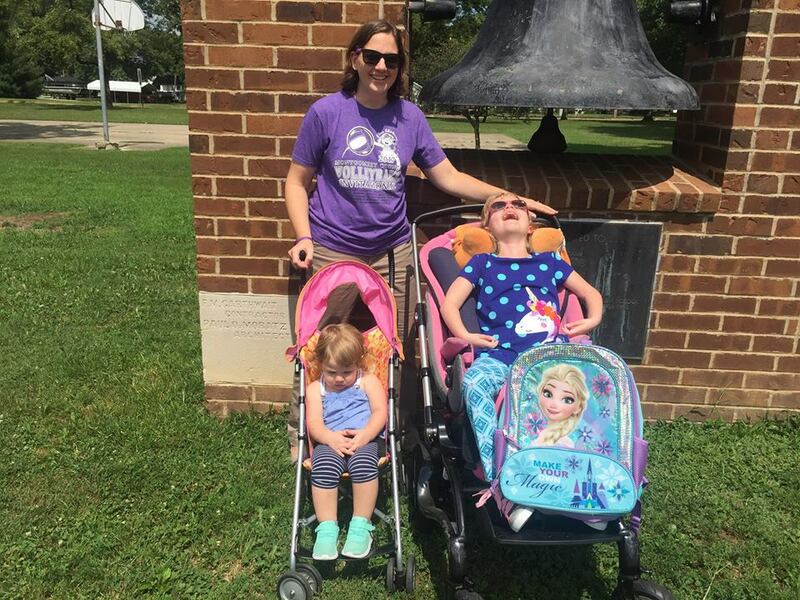 Before she was diagnosed with INAD, we had heard some really great things about Kids at Koke Mill through Memorial Medical Center, and we thought it might help Grace get walking on her own. 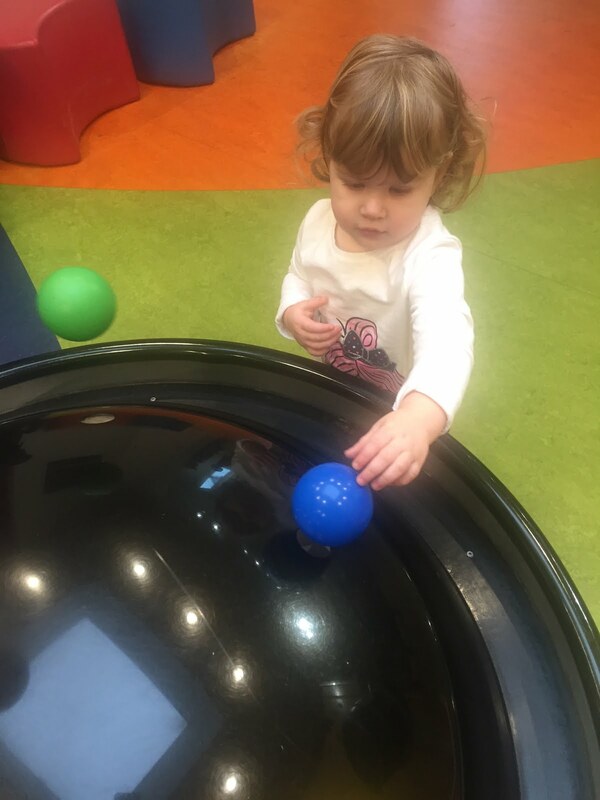 Although, we would later learn Grace would never walk on her own, we have kept up the weekly sessions with Amy, as we feel like it's still very helpful to Grace in keeping her skills up as long as we could. 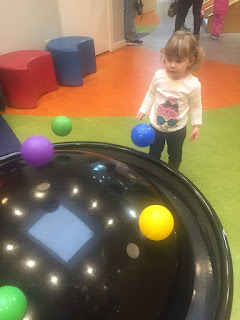 So, while our Fridays usually include a trip to see Amy, who has totally become like an extended part of our family, every so often, she's gone, and we get a day to play hooky! 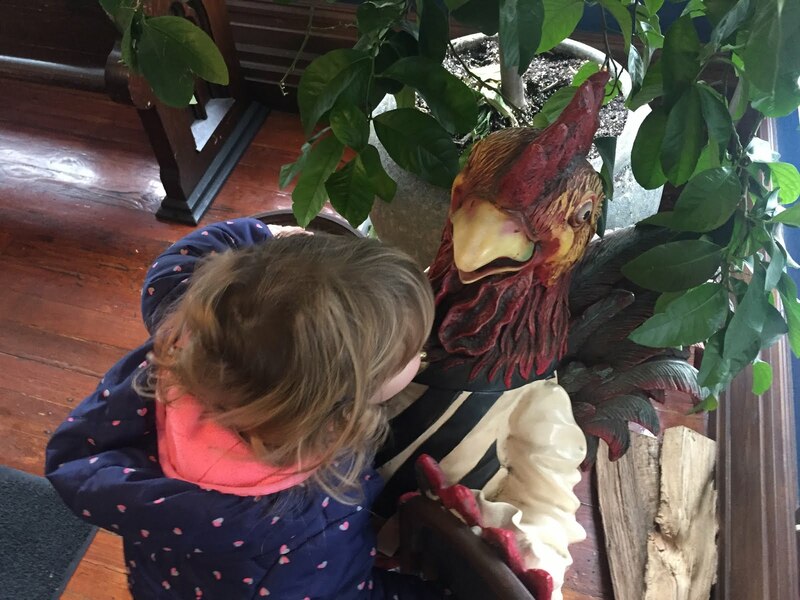 Waiting in line at Grace Meat+Three, Charley made a new friend. This past Friday was just one of those such days. Kyle had been wanting to go and eat at our favorite, Grace Meat+Three. We hadn't been there since the beginning of Christmas, and we really wanted to go back. We started making some tentative plans, but after getting several inches of snow the weekend before, we didn't really decide to go until late Thursday evening. But this time, the weather missed us, and we decided it was a great day for an adventure. Our first stop was the illustrious Grace Meat+Three for lunch, which was delicious as always. I love their fried chicken, so that's usually what I get. Kyle is much more adventurous than me, and got a fried bologna sandwich. I think he tries something different every time we come, and he's never disappointed. We also got to visit a bit with owner and chef Rick Lewis, who is always so kind to us. He took a long time to talk to Grace toward the end of our meal and thank her for coming on her day off. Though she mostly eats Pediasure, she did get to try some of Kyle's leek soup and some of my mashed potatoes and gravy. We also stopped to take her photo with Flat Gracie by her license plate. 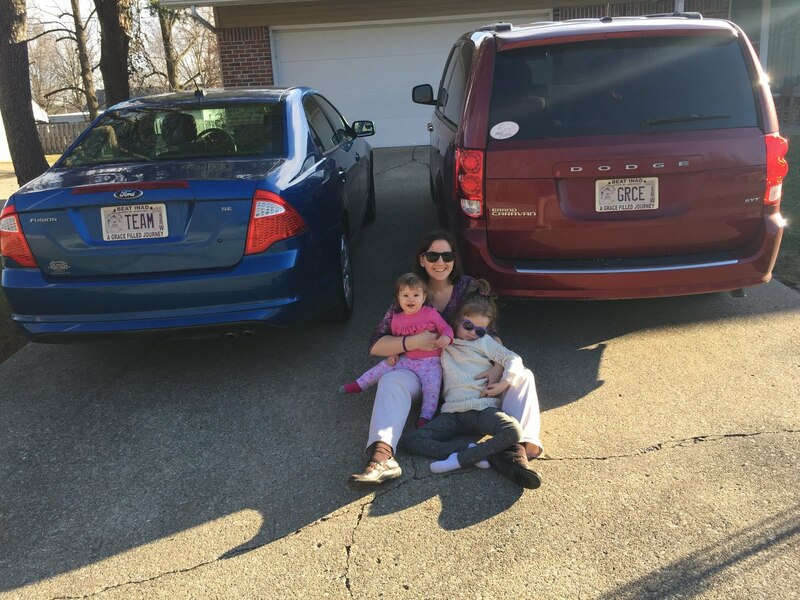 The last time we did the Grace license plate fundraiser, we got TEAM GRCE for our two vehicles. After it was displayed on our vehicle, we gave it to Rick, where it graciously hangs on the wall in the restaurant next to a tray signed by Andrew Zimmern. This was one of Charley's favorite stations. After finishing lunch, and talking ourselves out of dessert, we thought it would be fun to take the girls to the Magic House. Grace had been once before when she was not much older than Charley, and it had been a really great time. So, we thought Charley might think the same, and the afternoon definitely did not disappoint. 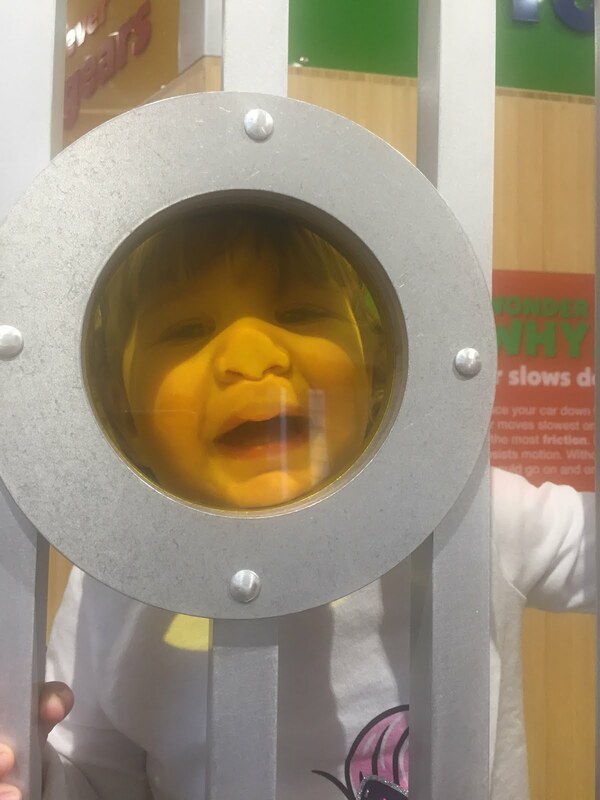 Being silly and having fun. I can't even tell you what Charley enjoyed the most because she just ran from thing to thing trying absolutely everything you could do there. She seemed to really enjoy anything you could climb on or climb in, and she even tried to climb into the water table. 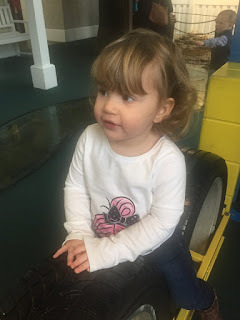 Even with a smock, she was drenched in the few minutes she played in the water table, but she loved every minute. I can remember going to the Magic House as a little girl, when it was actually just a much smaller house. But my favorite part was always the electrostatic generator on the top floor where your hair stood straight up. That was one thing I really wanted to do with the girls, and it was a lot of fun too. Training hard with some of our favorites! 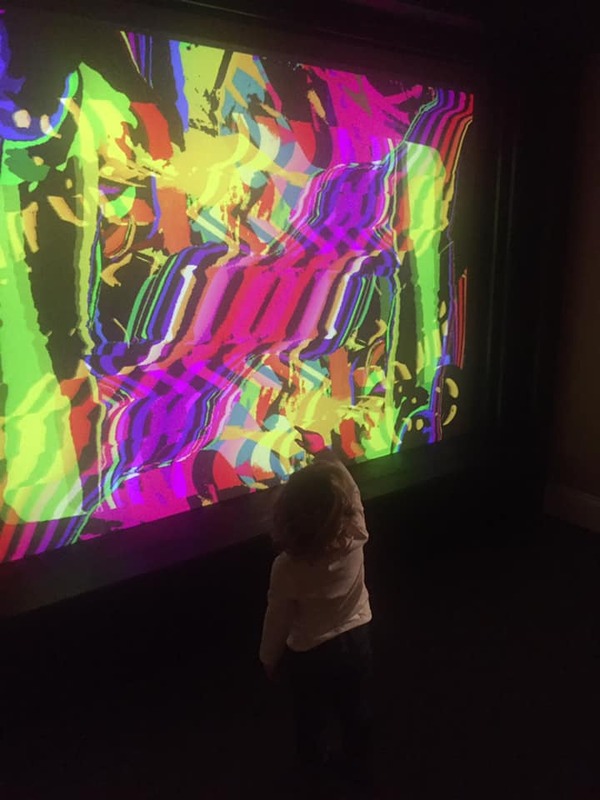 Grace liked some of the sensory rooms with different colored lights. One of our favorite things we did that day was an ocean-themed room. Kids had the chance to color an ocean dweller, scan it, and it would appear on the wall. 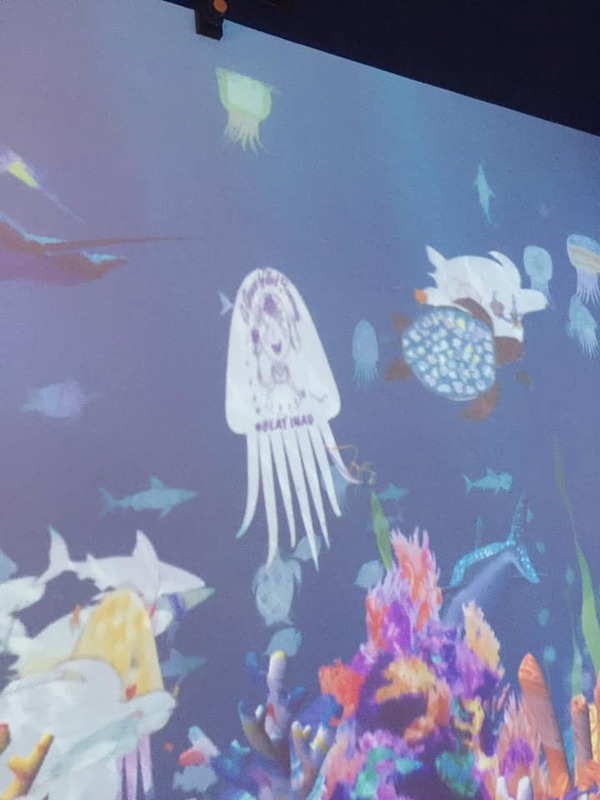 I helped Charley color a jellyfish, and Kyle put Flat Gracie on it when he scanned it, leaving #BeatINAD floating on the wall. It was kind of a neat way to raise more awareness. Charley is dancing with Grace. After a couple of hours, Charley was exhausted, and so was her mommy after chasing her around those two hours, and we decided to head home, grateful that the forecasted weather held off at least for the drive home. 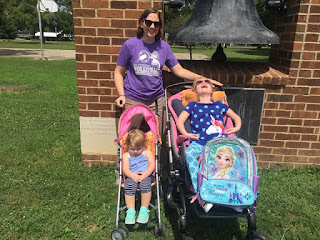 Most weeks, our schedule is set, full of therapy appointments, school days and work, but every so often, it's nice to play hooky and have a family adventure together. We can't wait for the next one! 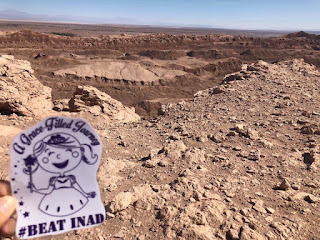 If you follow our Grace-Filled Journey on Facebook, then you've noticed one of our latest ideas to raise awareness for INAD, the Adventures of Flat Gracie. And we wanted to take a few minutes to tell you a little more about our latest endeavor. 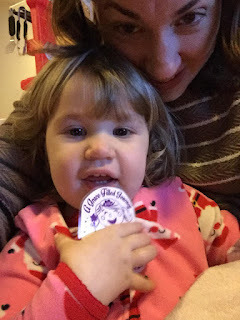 Grace is so excited to share Flat Gracie this year! They say that imitation is the highest form of flattery, and we have to confess that we got the idea from Flat Stanley. Several years ago, my cousin Troy's daughter, Madison, sent me a Flat Stanley in the mail. They live in Texas, and Flat Stanley is a cutout of a character that was decorated by Madison. My job (and I blush to admit it took me WAY too long to complete) was to take Flat Stanley on adventures, take photos and write about our experiences. The idea was that it would help the students to learn about other places. I took Flat Stanley around Montgomery County, but one of my favorite places I took him was the pressroom of the newspaper office, and I included a copy of the paper when I mailed Flat Stanley back to her after our adventures. Charley likes to help raise awareness too! I hadn't thought about Flat Stanley in a long time, but last summer when Kyle and I were preparing to go on vacation to Washington DC, we sort of brainstormed a similar idea and Flat Gracie was born. We used the princess logo from the first Grace Race, as well as our favorite hash tag #BeatINAD. The very first Flat Gracie photo was taken in the driveway of my parents' house as we departed on vacation. 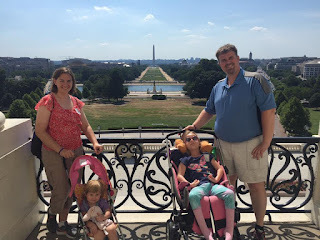 We continued to take photos throughout our trip, some at fun restaurants, others at historic sites, and shared our journey with those who follow Grace's story on Facebook. At the time, we just kind of felt like it was a fun way to share our adventures together as a family. Our very first Flat Gracie photo before our vacation. When we returned home, we had several people ask us about taking Flat Gracie with them on their own adventures. Most notably, Kylie Walch, who has taken Flat Gracie all over South America these past few months. I encourage you to hop over to our Facebook page for some truly amazing photos. 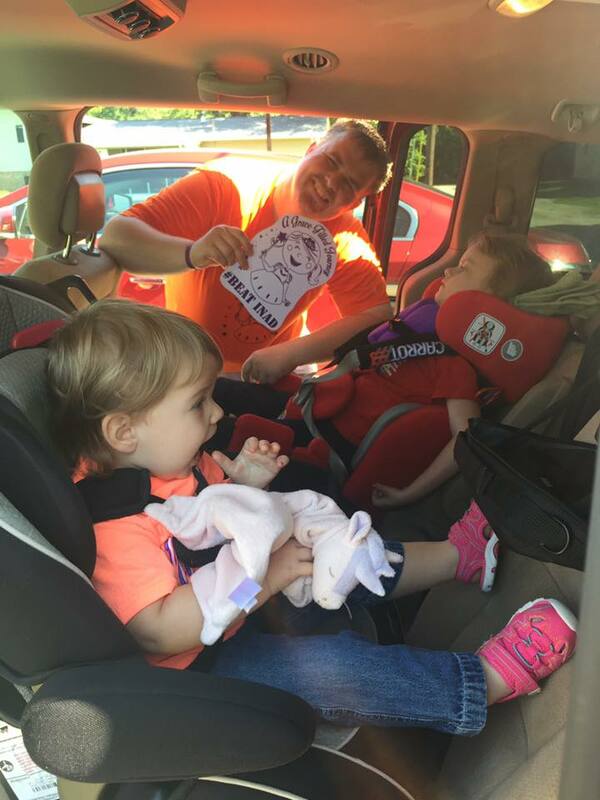 We always use the hashtags #flatgracie and #BeatINAD to make them easier to find. As we got ready to put together our Christmas cards this year, we decided that it might be fun to put a Flat Gracie in each of the cards we sent out, just for fun and to raise more awareness. We are only two weeks into the new year, and already half a dozen people have shared photos with us, including stops in Columbia, South America and the Panama Canal. 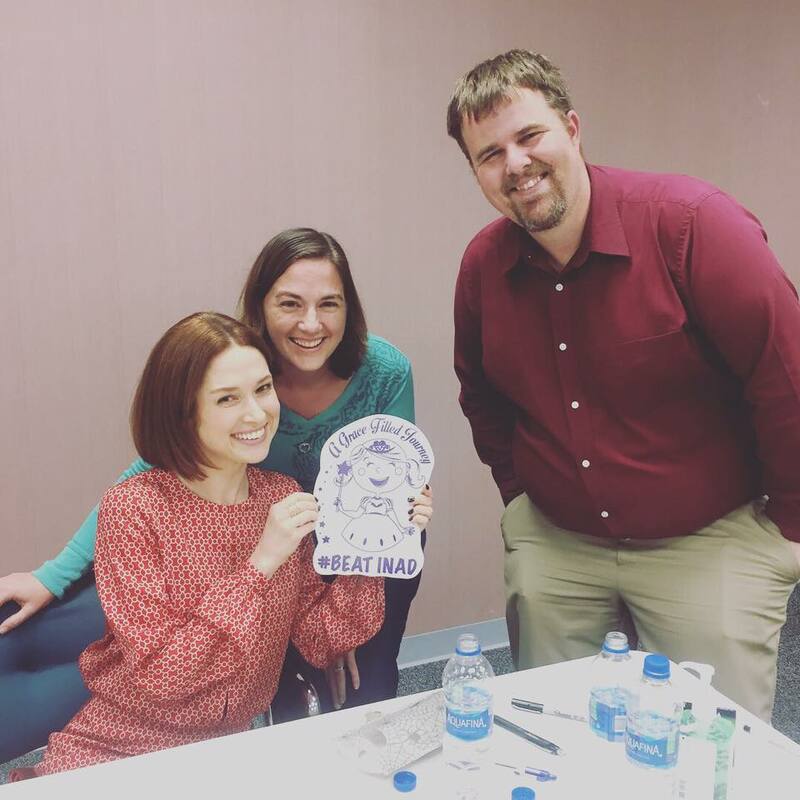 Flat Gracie met Ellie Kemper at a book signing this fall. 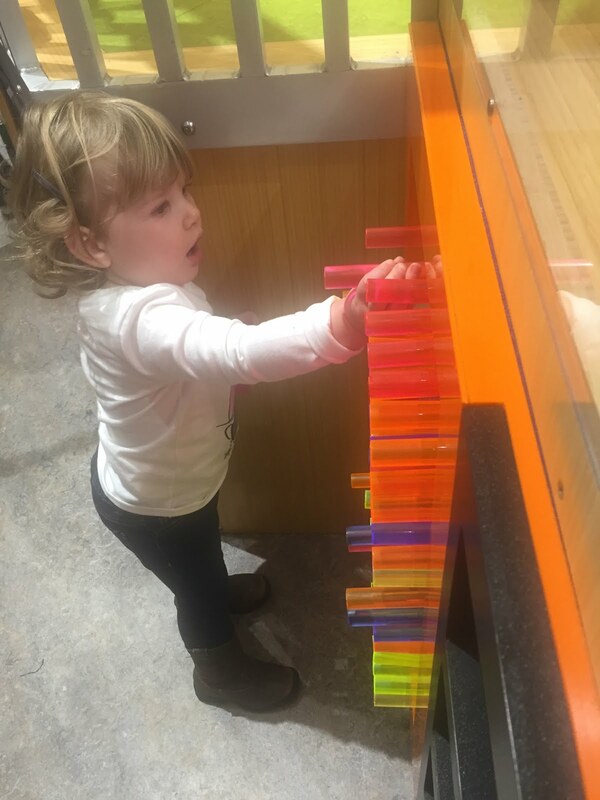 We're trying to save all the photos from this year in hopes of making a book of all of Flat Gracie's adventures. For us, it's so encouraging to see others share in Grace's story. We feel so loved knowing that so many of you stop to keep us in our thoughts and prayers. 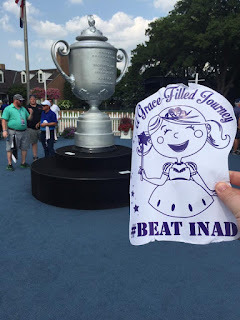 Flat Gracie at the PGA golf tournament in St. Louis last summer. We also feel that it's so important to keep raising awareness for INAD. Right now, there are about 100 documented cases of INAD in the entire world. 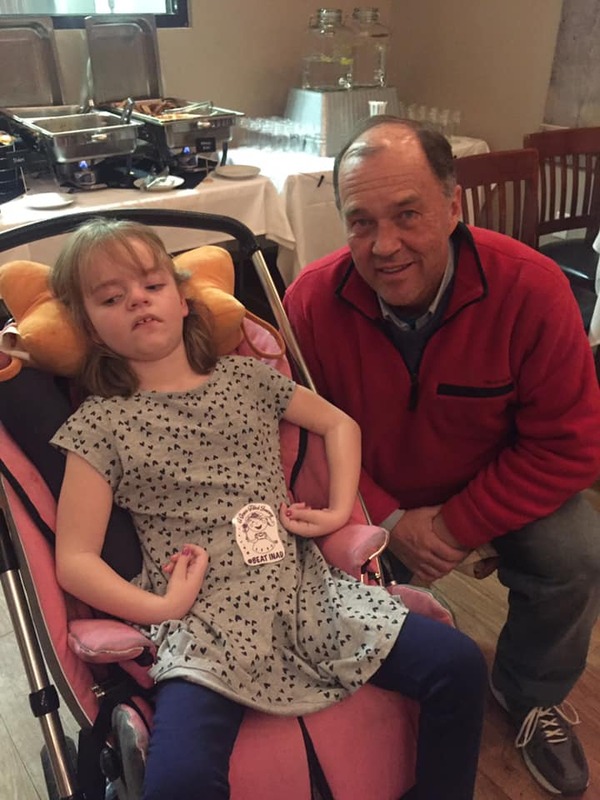 In reality, there are probably more than that out there, but it's still considered an ultra-rare disease, and additional awareness often means more funding for research, which is so important if we're ever going to find a cure. Flat Gracie in Moon Valley in Chile, South America. 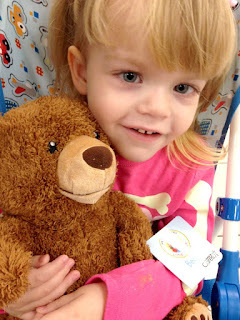 Over the coming year, we hope you enjoy the Adventures of Flat Gracie as much as we like sharing them. 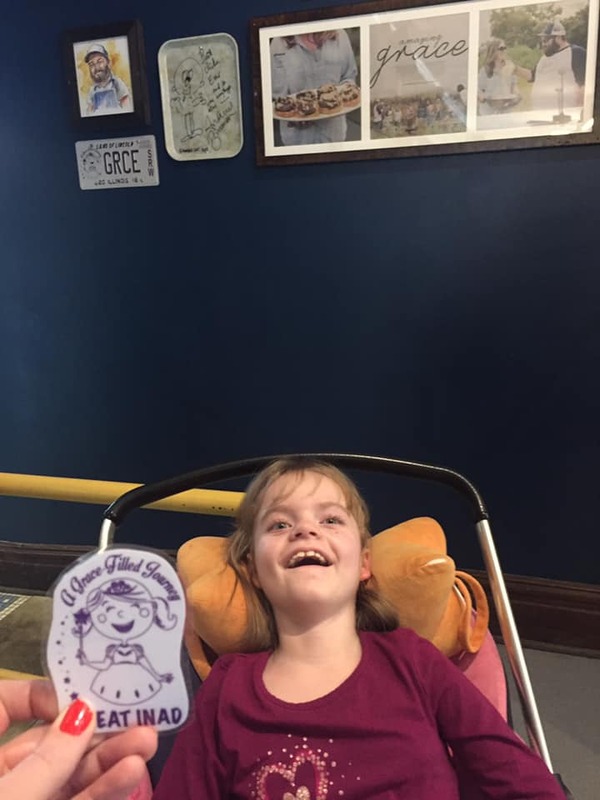 And if you'd like to have a Flat Gracie of your own, you can send us an email at agracefilledjourney@gmail.com with your contact information and we will mail one to you. We will also post a PDF on our Facebook page that can be downloaded so you can print out your own. 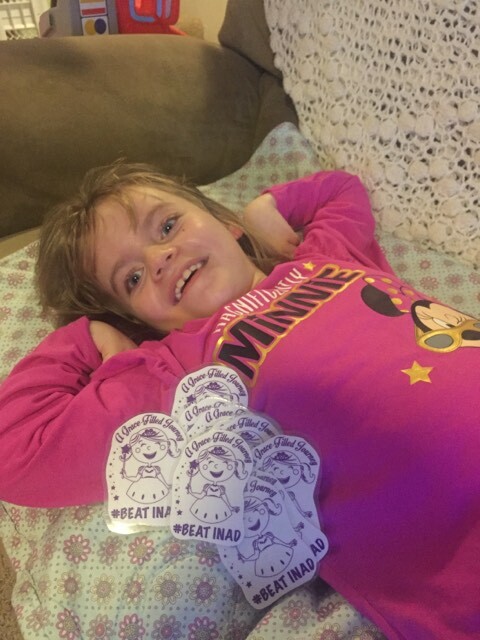 Thanks for continuing to follow our story, and we can't wait to see where Flat Gracie's adventures take her in the coming year!